17. Capt. Jack Gurwitz, Boston, MA operates on a patient suffering from a compound fracture of his thigh and injuries to his blood vessels. 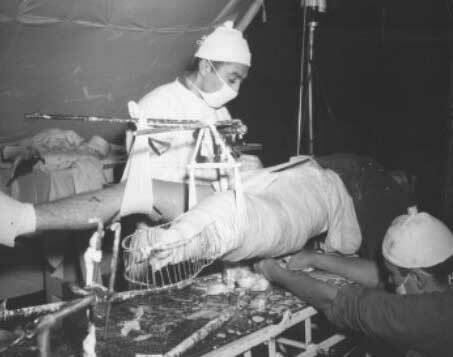 Amputation was necessary because of gangrene of the foot. The American National Red Cross shipped the blood used in transfusion from the United States. Helping Capt. Gurwitz is Tech 5 Vincent Luther, Patton, PA (lower right) of the 93rd Evacuation Hospital, 7th Army, 7 November 1944 in Plombiers, France.